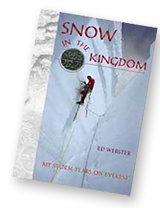 "For Snow in the Kingdom, which I have now eagerly read from start to finish, my one-word description is Masterwork. You have agreat deal to tell, and you tell it admirably; you build ... to the almost overwhelming adventure on [Everest's] Kangshung Face.... I'll treasure my inscribed copy."